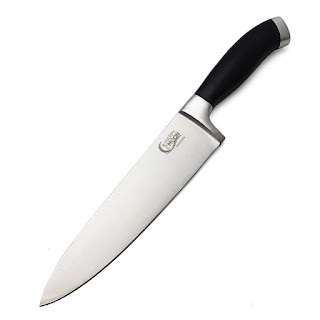 #HappyMoonKitchenware Happy Moon Kitchenware has come out with a great Chef Knife, it's a great addition to my kitchen. This knife is nice and sharp and has great balance, feels good in my hand. The handle is ergonomically designed so you can use it for long periods of time comfortably. The blade is 8" long, which is the perfect length for slicing and chopping. The blade is forged from 3CR13 Stainless Steel.It's made to last, very high quality. I cook a lot, so my kitchen tools are very important to me, I am very pleased with this knife and highly recommend it.